Atopic dermatitis is an inflammatory skin condition characterised by dry, pruritic skin with a chronic relapsing course. It primarily affects young children and mainly flexor surfaces such as the cubital fossa and back of the knees. Diagnosis is based on history and clinical features. Management includes use of emollients, moisturizers and steroid cream. Atopic dermatitis is a chronic highly pruritic (itchy) inflammatory skin disease. Atopic dermatitis and eczema are often used synonymously. Atopic dermatitis primarily affect young children and is often associated with other atopic disorders, such as allergic rhinitis and asthma. The prevalence of atopic dermatitis has doubled or tripled in industrialised countries during the past three decades. Not only are patients affected by the social stigma of a visible skin condition, but the intense itching characteristic of the disease often leads to significant sleep as well. 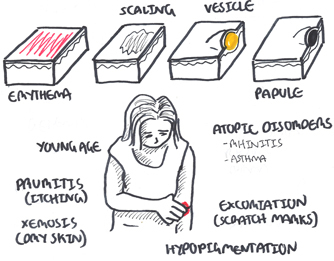 Left Image Diagrammatical section of a normal skin. The skin has three layers the epidermis, dermis and hypodermis (which often is not classified as a skin layer because it mainly consists of adipose tissue). Right Image Inflamed, scaly and dry skin; features of dermatitis. The incidence of atopic dermatitis appears to be increasing. It may occur in any race or geographic location, although there appears to be a higher incidence in urban areas and developed countries, especially Western societies. These layers are bound firmly thanks to the Filagrin gene which is responsible for making proteins important for proper skin barrier function, particularly structural proteins in the stratum corneum and granulosum, that help bind keratinocytes together. Signs and symptoms Eczema mainly affects young children and most grow out of it, however, for some eczema is long term. 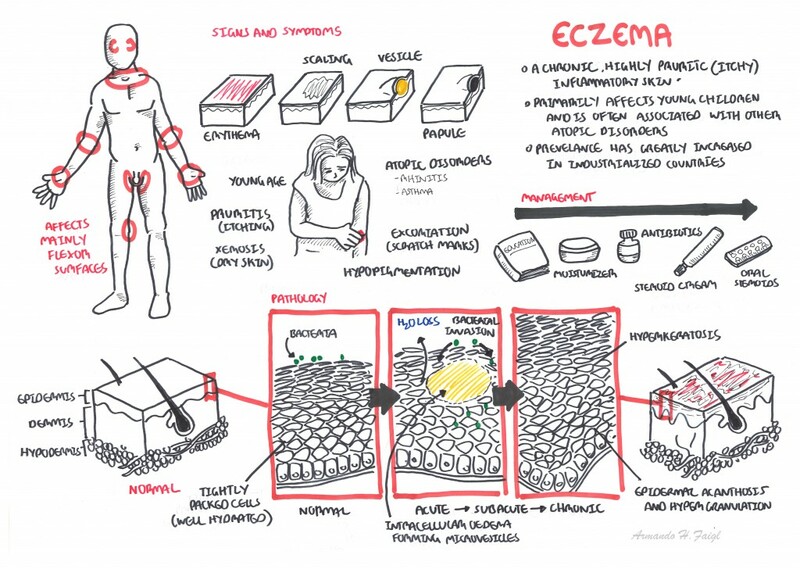 Eczema is strongly associated with other atopic disorders such as rhinitis and asthma. The skin lesions are described as scaling, xerotic and sometimes erythematous with vesicle and papule forming. There are signs of excoriations and hypopigmentation as eczema is a highly pruritic skin condition. Seborrhoeic dermatitis is a common, chronic or relapsing form of eczema/dermatitisthat mainly affects the scalp and face. It can be associated with psoriasis. Dandruff is an uninflamed form of seborrhoeic dermatitis. History of skin creases being involved. The presence of generally dry skin within the past year. Symptoms beginning <2 years of age. Visible dermatitis involving flexural surfaces. For children under four years of age, this criterion is met by dermatitis affecting the cheeks or forehead and outer aspects of the extremities. Atopic dermatitis can be though of a complex genetic disease arising from several gene gene and gene-environment interactions. Many genes have been associated with atopic dermatitis, especially what’s known as the filagrin gene on chromosome 1. 50% of people with atopic dermatitis carry a mutated filigrrin gene .The filagren gene encodes a structural protein essential for skin barrier formation. There is thought because of a more westernised industrialised lifestyle more people are developing eczema. This compliments the so called hygiene hypothesis which states that the decrease in early childhood exposure to infections, has increased susceptibility to atopy, tendency towards allergy. Two main hypothesis proposed in atopic dermatitis. IL 13 -> stimulates B cell class switching to IgE (Elevated IgE are present in only 50% of patients with AD). 1. The epidermis is the first line of defence between the body and the environment. The skin barrier keeps environmental irritants, allergens, and microbes from entering the body and prevents excessive water loss. 2. Filagrin gene is responsible for making proteins important for proper skin barrier function, particularly structural proteins in the stratum corneum and granulosum that help bind keratinocytes together. 3. Mutation in the filagrin gene results in skin barrier dysfunction and water loss which causes eczema. 4. Impaired skin barrier also increases penetration of allergens into skin allergic sensitisation to asthma and hay fever. Pathology Epidermal intercellular oedema (spongiosis) and a prominent perivascular infiltrate of lymphocytes, monocyte, macrophages, dendritic cells and a few eosinophils in the dermis. 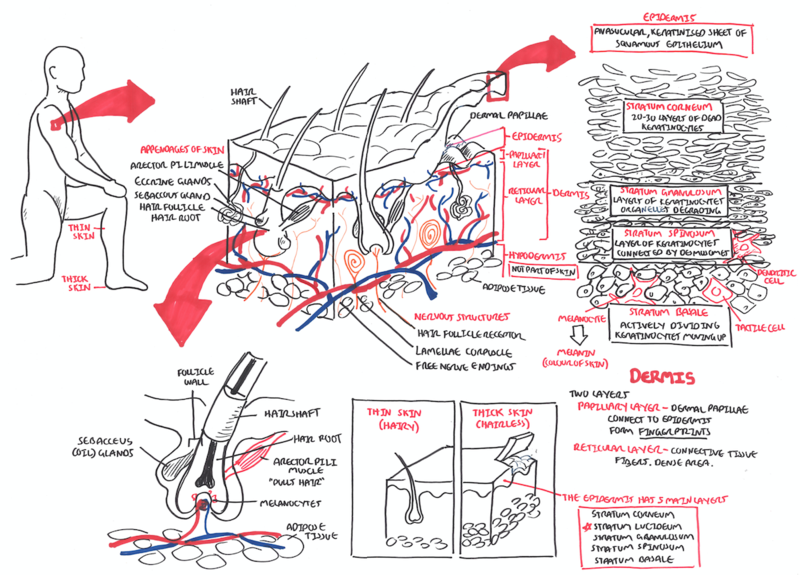 In subacute, chronic stages—epidermis is thickened and its upper layer is hypertrophied. Education: Education on the chronic nature of disease importance of treatment adherence, appropriate use and application of topical therapies. Skin care: Use of emolients/moisturizers for hydration of skin. Topical corticosteroids: The mainstay first line treatment for Atopic Dermatitis. There are four different classes based on the potency. Topical calcineurin inhibitors (IL2 Inhibitors): An alternative to corticosteroids. Management It is important to educate parents on managing their child eczema with the use of emollients, moisturisers and steroid creams. Oral antibiotics are used for severe cases. Most children lose their eczema, and other atopic disorder such as asthma, as they grow older. Pharmacology Calcineurin is a IL2 inhibitor, technically it is a Calmodulin inhibitor. Calmodulin is an activator of a powerful transcription factor NFkb, which promotes IL2 production in immune cells. IL2 normally promotes the inflammatory response by recruiting more lymphocytes to the tissue. Inhibiting Calmodulin suppresses IL2 production and so suppresses the inflammatory response. Oral calcineurin is used in Rheumatoid arthritis and other rheumatological conditions. Side effects of topical calcineurin is minimal. Atopic dermatitis is a chronic disease with a varying course.